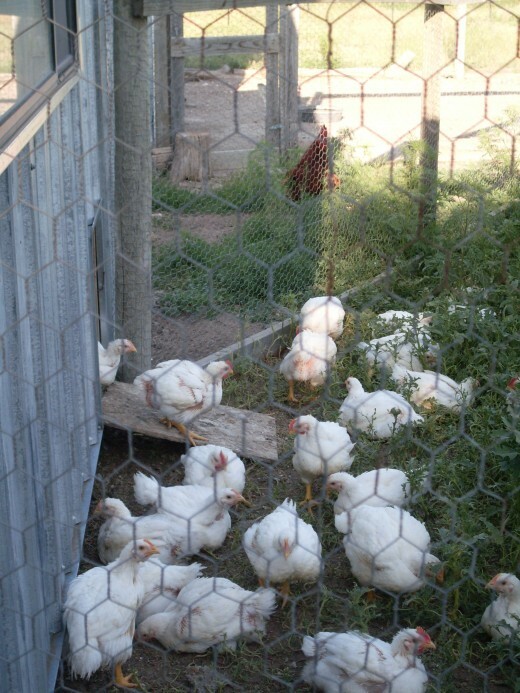 Joy has helped raise and butcher poultry for 20 years, from chickens, ducks, & geese to guineas & turkeys. The journey has been delightful! 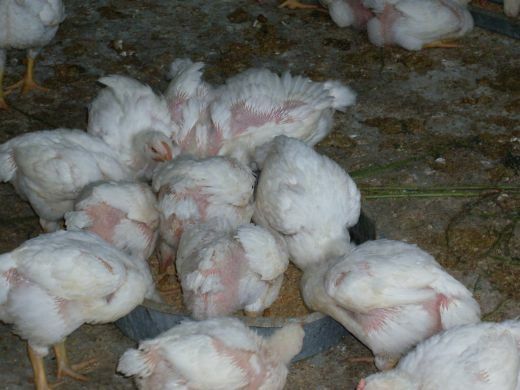 It is my desire to show you what goes on in the life of a chick raised for meat purposes. I will show you the life progress of 100 "barbecue special" chicks from the Murray McMurray Hatchery. 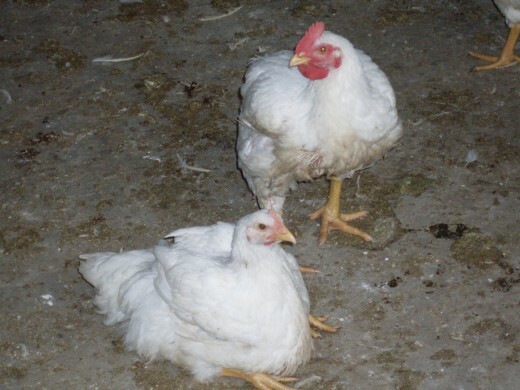 This means the batch includes jumbo Cornish rock chicks, as well as Cornish roaster chicks. These birds are not going to grow up to be beautiful egg-layers. They will turn into slightly disgusting eating machines, designed to be eaten in turn. Furthermore, they are hybrids, and will not successfully produce offspring of their own. 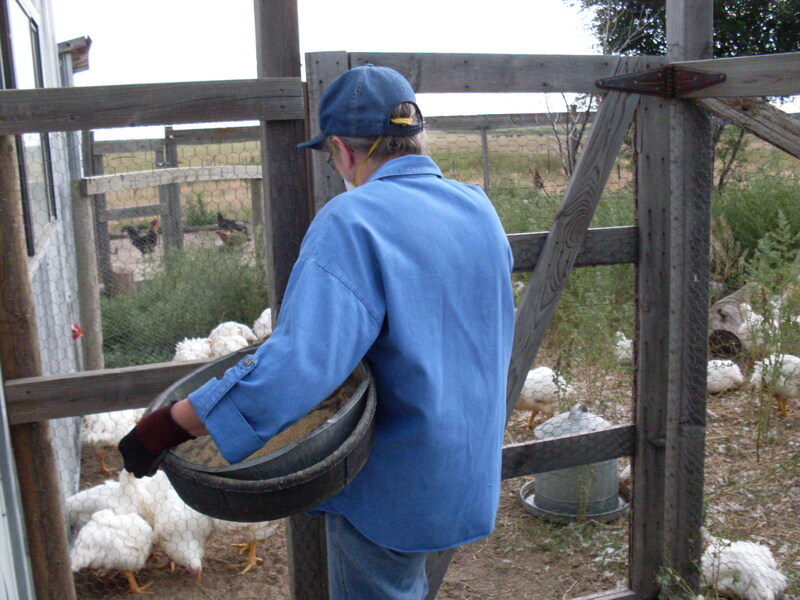 If you'd rather not know how this food is raised, please skip this article. 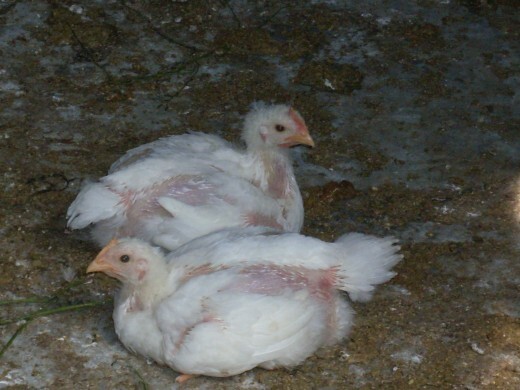 Note: The methods of caring for these chicks shown here do not necessarily parallel commercial practices. This is a privately owned farm, and is not a "battery" operation. In each group of chicks, there is one "odd" one. It's like getting a prize in the bottom of the cereal box, and it is fun to figure out what the breed is. This one seems to be a Buff Laced Polish. The home for the chicks has been carefully prepared. 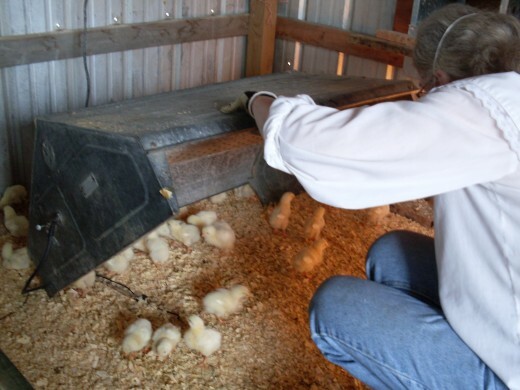 Miss Heather, their caretaker, has cleaned the chicken house carefully, sanitizing the walls and floor so the new chicks cannot get disease or possible illness left from the last batch. 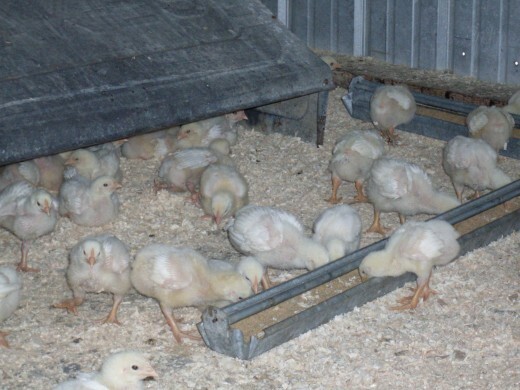 Every precaution has been taken to ensure the chicks' home will be bright, healthy, and comfortable. We use wood shavings on the floor to make it warm and comfortable. These are bought in bags. 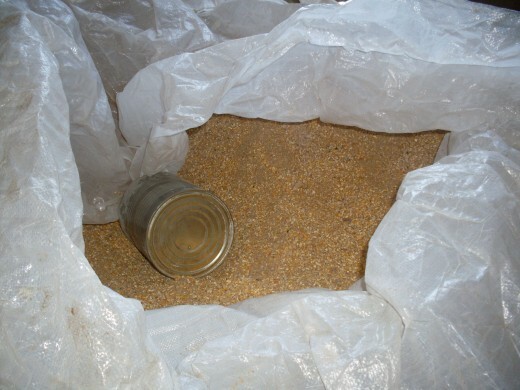 Rice hulls can also be used. 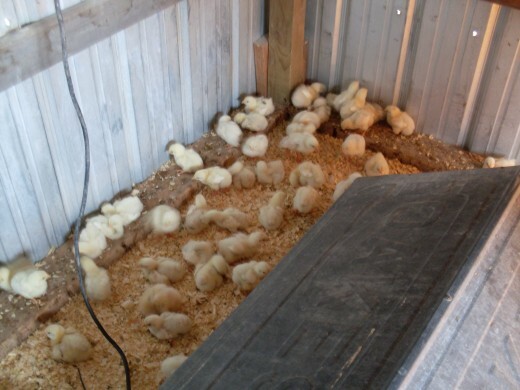 The chicks are shipped in cardboard boxes by U.S. mail to Miss Heather's local post office, and she must pick them up there before bringing them home. 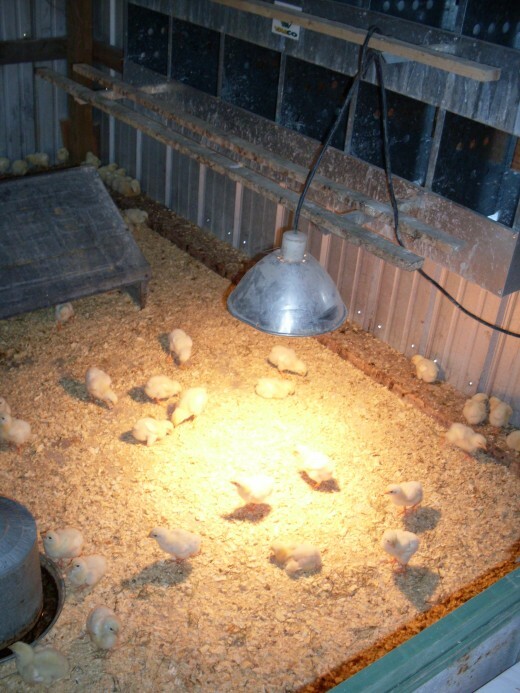 Baby chicks must be kept between 90 and 95 degrees F., and so require a heat lamp or a brooder at first. She has prepared an enclosure of old window screens to ensure the chicks do not range too far from the brooder and heat lamp. These items will do the work of a mother hen's wings until they are old enough to brave the world. They arrive happy, healthy, warm, and dry. 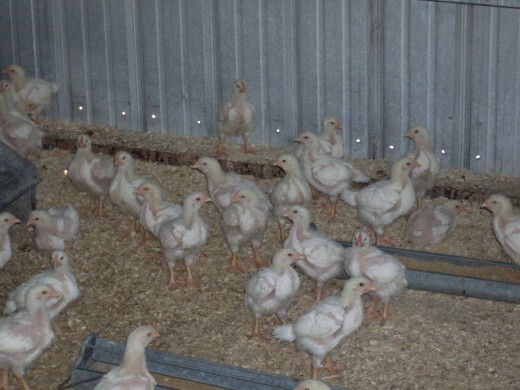 They are fed commercial chick starter, which is a formulation of different grains and proteins, designed to get new chicks off to the best start possible. To prepare the chicks for their new life, we show them where their water and food is by dipping their beaks in each. 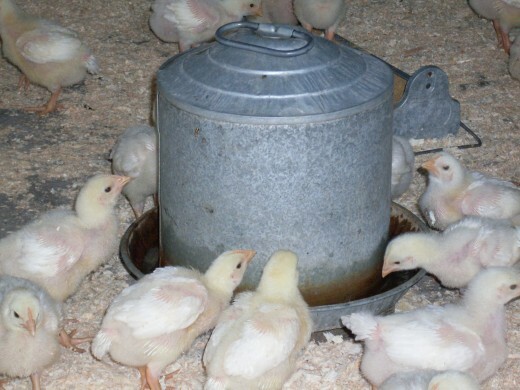 Three tablespoons of sugar are added to each quart of clean water to provide the chicks with energy to recover from shipping. My two-year-old daughter enjoys them very much, though she is not allowed to go into their enclosure. These chicks grow extremely fast compared to most other breeds. They are, therefore, provided with vitamins in powdered form, which can be sprinkled on their food or in their water. Because they grow so fast and are so gluttonous, their food must be taken away each afternoon to keep them from overeating. If they are allowed to overeat, they develop congestive heart failure, and also problems with their legs (they don't bear their own weight well, and the legs can break). 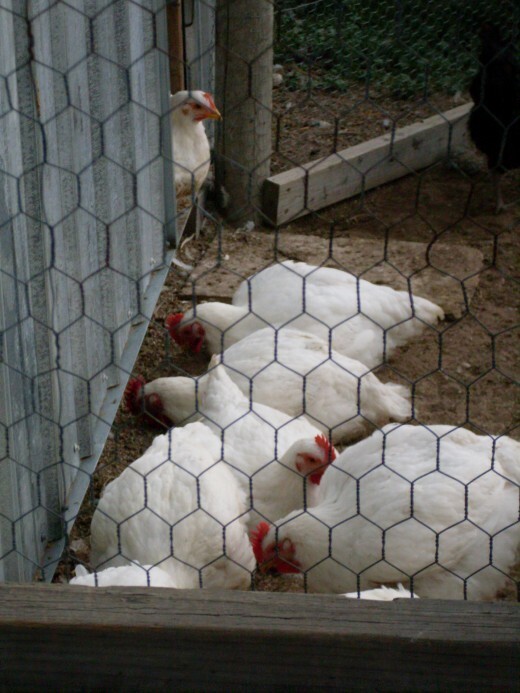 If their food is not religiously regulated, even if their conditions are otherwise healthy, they become lethargic and do nothing but lie about near their food trays. Sometimes newly hatched chicks have trouble digesting their food, and get "gummed up." Miss Heather catches two that need their bottoms washed, and takes them outside to the hydrant to gently help them. 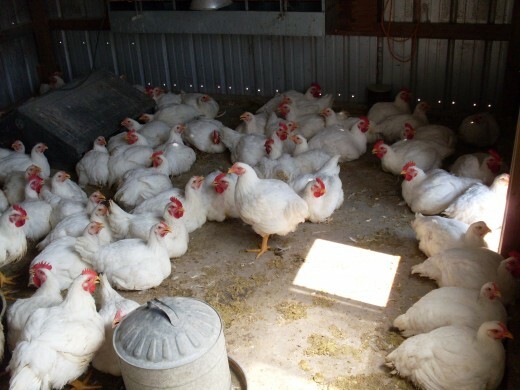 If not cared for thus, these chicks would die. Beginning on the third day, something called "baby grit" is sprinkled on their food. 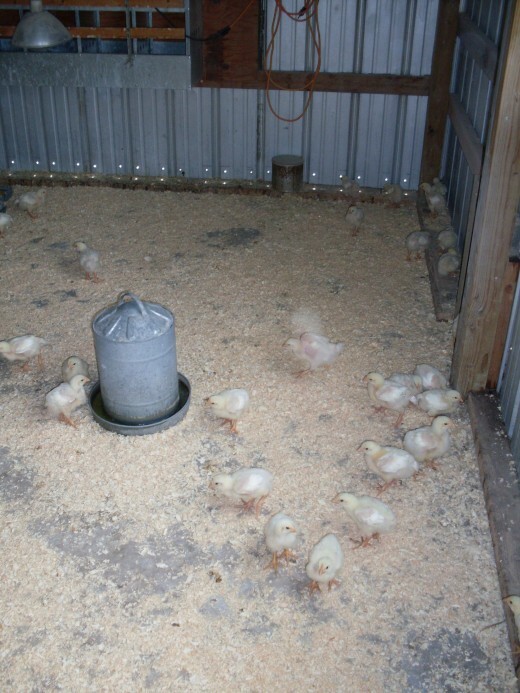 Even baby chicks have gizzards, so sand is given them to help them digest their food. With 100 chicks, their enclosure must be cleaned every two days, otherwise, they develop respiratory problems from the ammonia they produce. 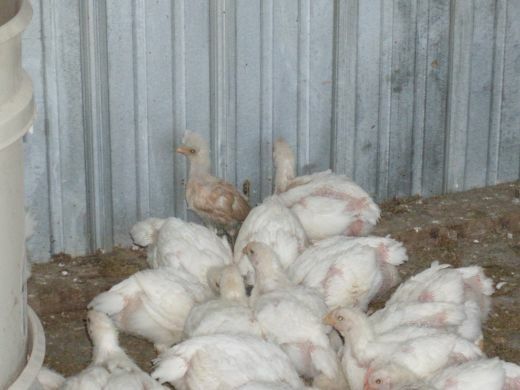 They rush about in groups, and spend a lot of time hiding under the brooder when approached. This week they are braver, and don't look so much like balls of down. They use their wings a bit when they run. The temperature is reduced by 5 degrees per week, until 70 degrees F is reached. They love to eat! 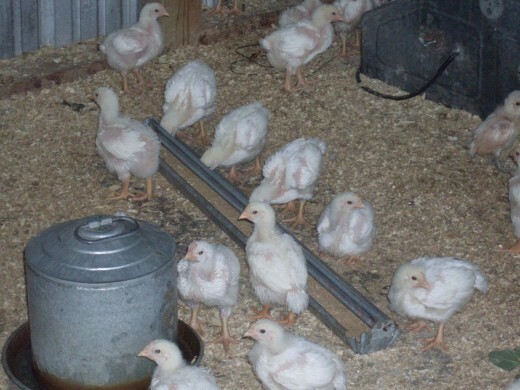 Presently, the 100 of them eat about 1 to 1 1/4 gallons of Chick Starter per day. Each week, their food intake increases dramatically. They also need the whole chicken house to roam in. Their water must be kept clean and changed at least once a day. Sugar is no longer needed. 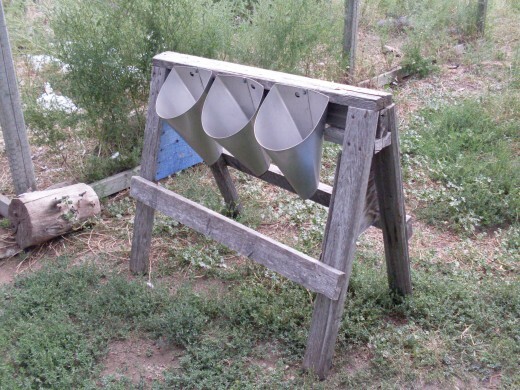 More feeders and waterers are needed, though, as the chicks should not have to compete for space. They now eat at least 2 1/2 gallons of feed per day. Miss Heather puts away the small feeders, and replaces them with two trays that are four-feet long. Miss Heather also picks greens and weeds for them to eat. They have begun to grow taller, and they stand up straighter. In short, they begin looking like chickens. 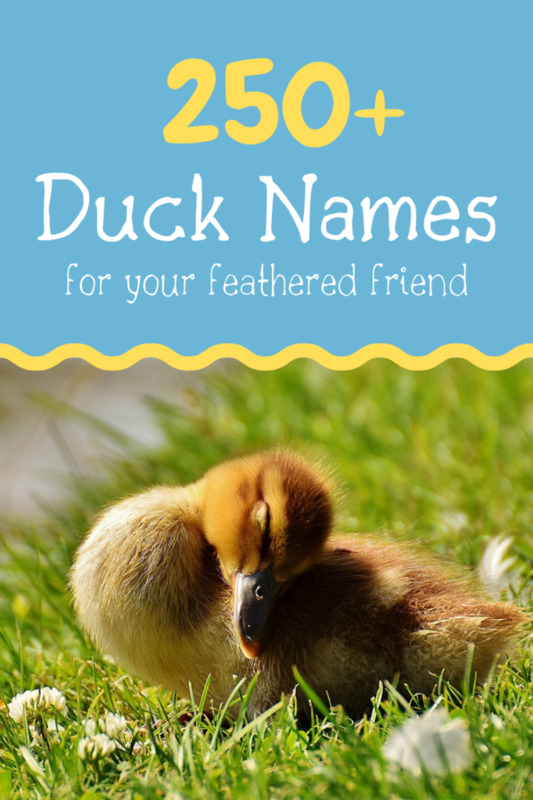 At this stage, they are a bit stalky, and their feathers are patchy. They have plenty of sunlight and do not peck each other, but they may need a window opened for ventilation. At this point, they are eating about four gallons of feed per day. Their protein needs increase from 18% protein to 22%. Miss Heather quit using sawdust on the floor, as they go through a lot of it now and seem comfortable without it. They resemble gangly teenagers about now. Here is the "odd" chick. Isn't he cute? Yes, chickens stink. At this point, it takes about 45 minutes per day to care for them. They are mature enough that they can be let out into their yard. Miss Heather has many predators who would love to share her chicks with her, or they might have been let out sooner. They can now pick their own greens. Chicks can be great weed whackers! They now eat from the two long feeders plus some round rubber feed pans, and consume 25 lbs. of grain per day. 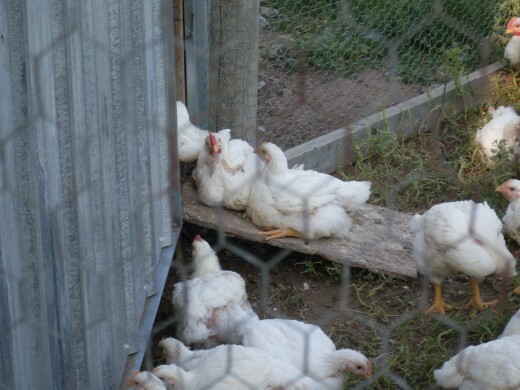 Although these chicks are more active than some previous batches, they still tire easily. Here they are shown resting half-way up their ramp. Miss Heather must now clean their house about every 36 hours. She uses the manure in her garden compost pile. They now eat 35 lbs. of feed per day. Miss Heather must go to the grain mill at least twice a week to haul home the 50 lb. sacks. 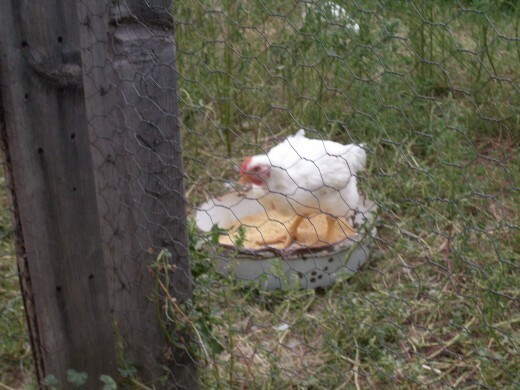 Chickens have no manners and crowd into their feed pans, pecking and shoving. Miss Heather cleans their house every 24 hours, and they require 1 1/2 to 2 hours of care per day. This one was napping in a feed pan before I approached. At this size, it would be possible to butcher some of the males to roast. They would dress out at 3-4 lbs. The hens are smaller. Some of the roosters are getting awfully heavy for their legs. 4 of the 100 birds are having trouble. The problem seems to be something similar to a sprain. These 4 are a bit stiff when they get up. One rooster, in particular, has trouble all the time now. He will be butchered early. 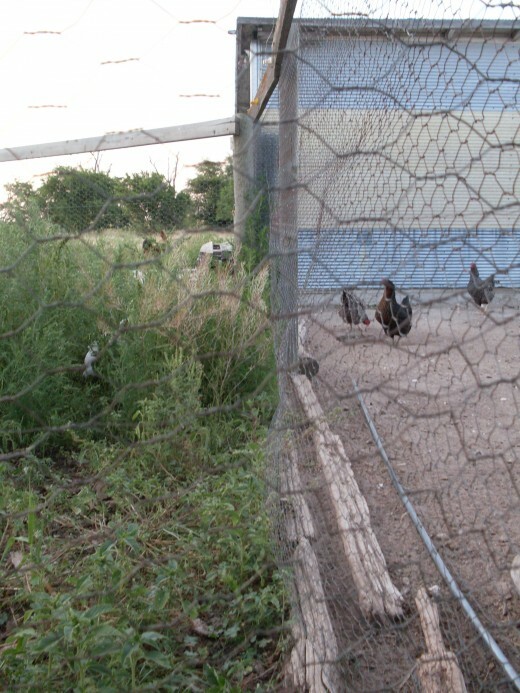 However, one hen stays beside him and tries as much as she can to encourage him to get up and go outside, and to smile. These birds are still not nearly as active as the laying hens. 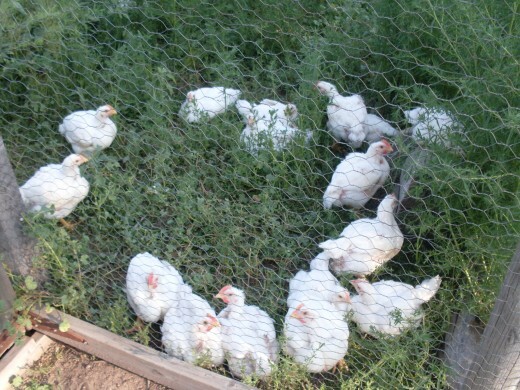 The hens eat down most of their weeds, as well as forage outside their pen. 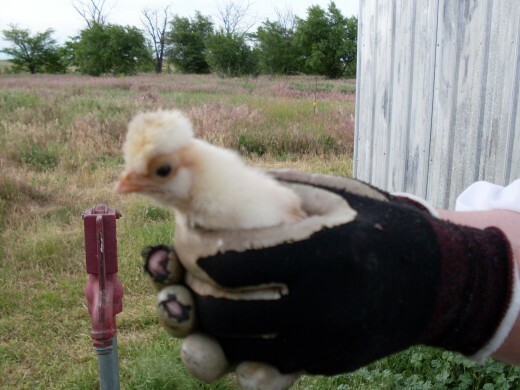 Here is the Polish Buff chick. I love him! He won't be butchered. Miss Heather always keeps her "off" chicks. They produce vivid offspring when she chooses to hatch her own eggs. 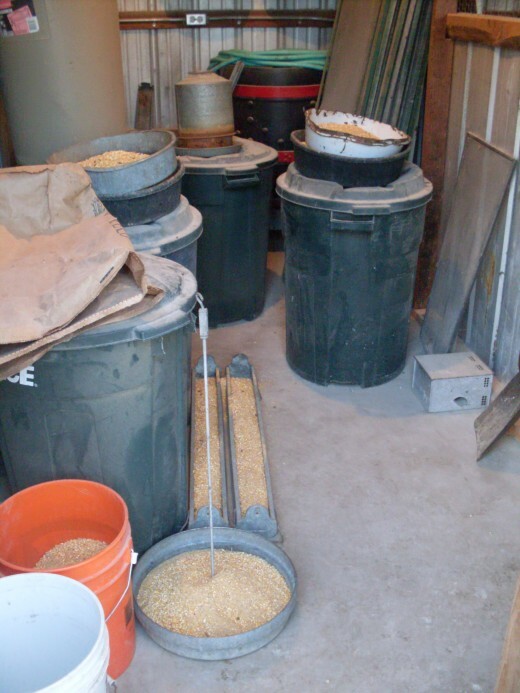 Here are the various feeders Miss Heather uses at this stage. What quantity! The barrels are full of millet for the laying hens. 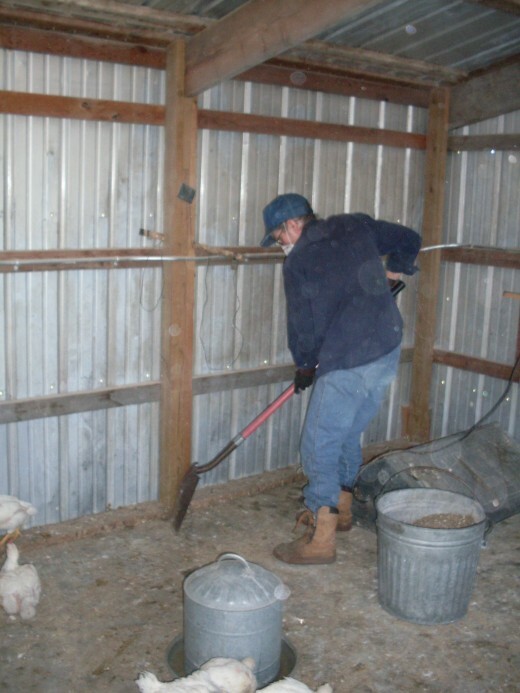 The chicks go through more than six gallons of water each day, and Miss Heather hauls away 5-6 gallons of manure daily. 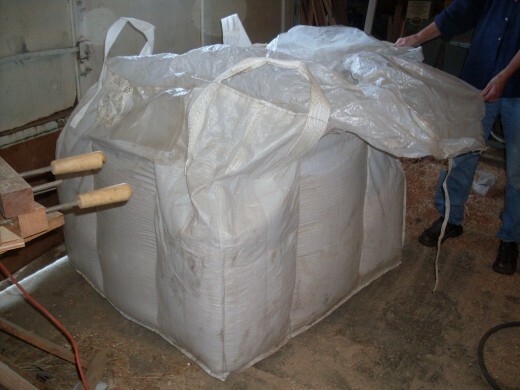 Here is the tote Miss Heather got from the feedmill this week to extend the time between trips to town for feed. It holds a good mixture of grains. The tote is roughly the size of a big pallet, and holds 1,500 lbs. of feed. 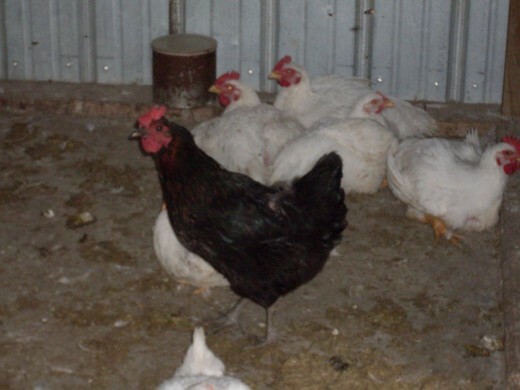 This black laying hen seems confused about what she is. I hope she figures it out by the time her friends here are through. The birds often pair up. It is sweet to watch their friendships. They love to sun themselves, lying in small groups near the windows, and of course, outside in their yard. Can you see how much bigger this rooster is than the hens? Miss Heather takes their feed away in the mid-afternoon. The feed ration has stayed about the same for the last 2 weeks, yet manure output has gone from 5 gallons per day to 7. 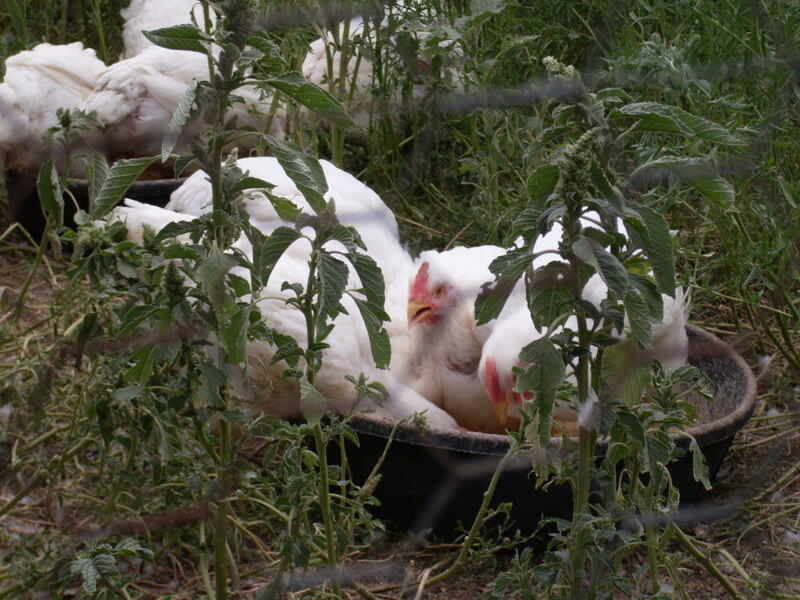 Immediately after their pans are taken, the birds hunt and peck for missed grain while lying down. They have gained 2-3 lbs. each over the last 2 weeks and are ready to be butchered. They are content as ever, eating, drinking, and making merry. It is midday, so many are resting indoors. 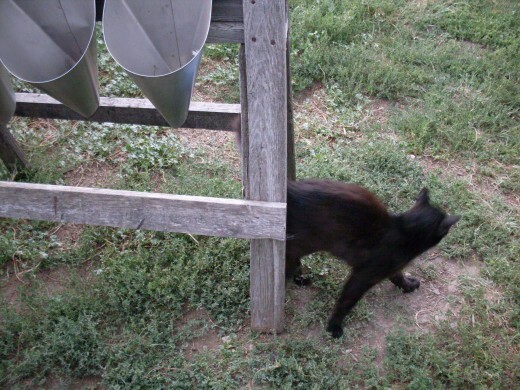 This black cat says it all. 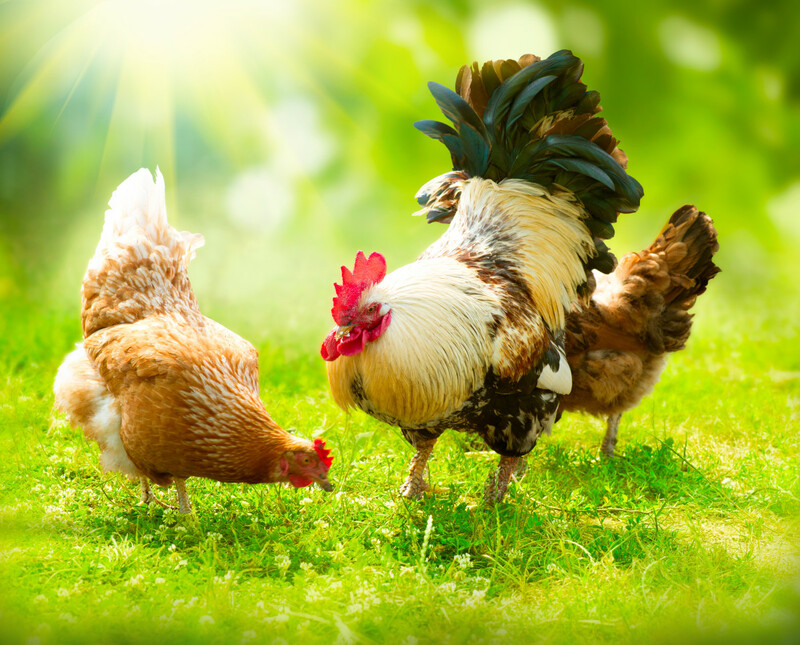 Would you consider raising your own chickens for food? Mmm, You're welcome! Keep in mind that some breeds mature more slowly than others. Cornish Rocks are one of the fastest maturing on the market. 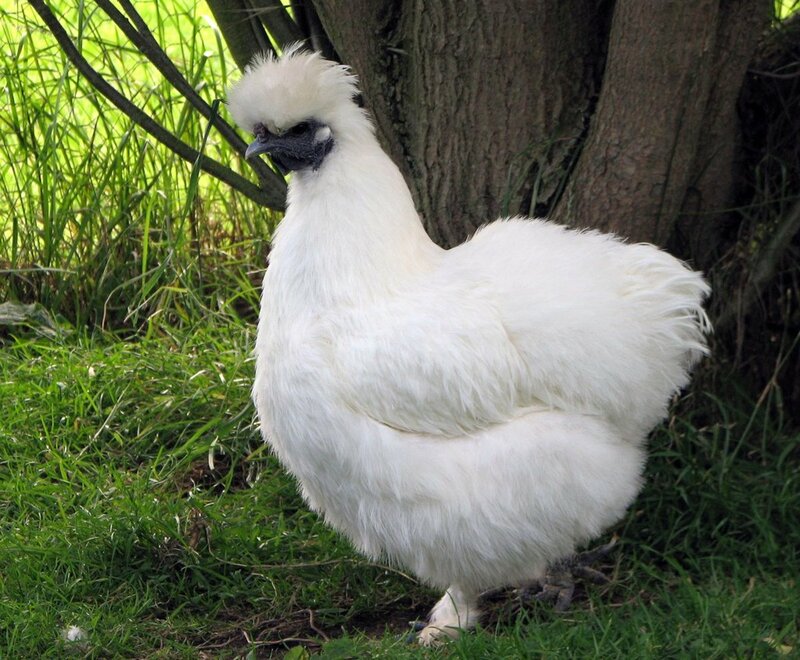 Some take as long as 24 weeks before being ready to lay eggs, and many multipurpose breeds average about 6-7 lbs. 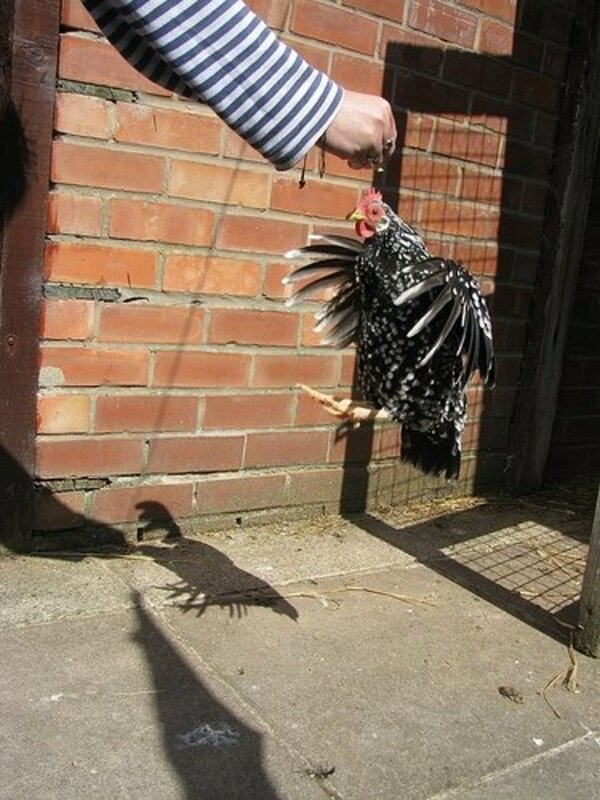 for roosters, live weight. 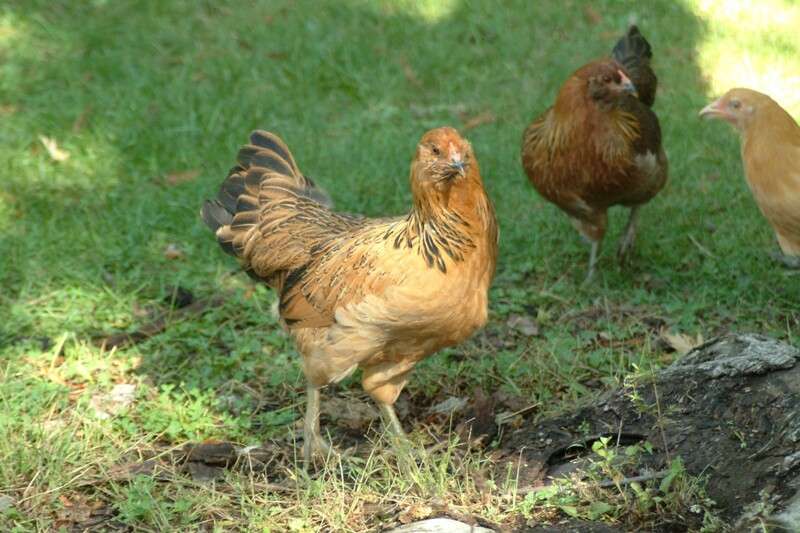 Egg laying breeds can be as little as 2-4 lbs. as adults. Allison, thank you for your very encouraging remarks. The crazy thing about these birds is that now they are being bred to grow to mammoth size in six weeks or less. Of course, most breeds will not do that. We quit raising this type, because they no longer seem ethical. Blessings on your chicken keeping! This is actually pretty interesting. 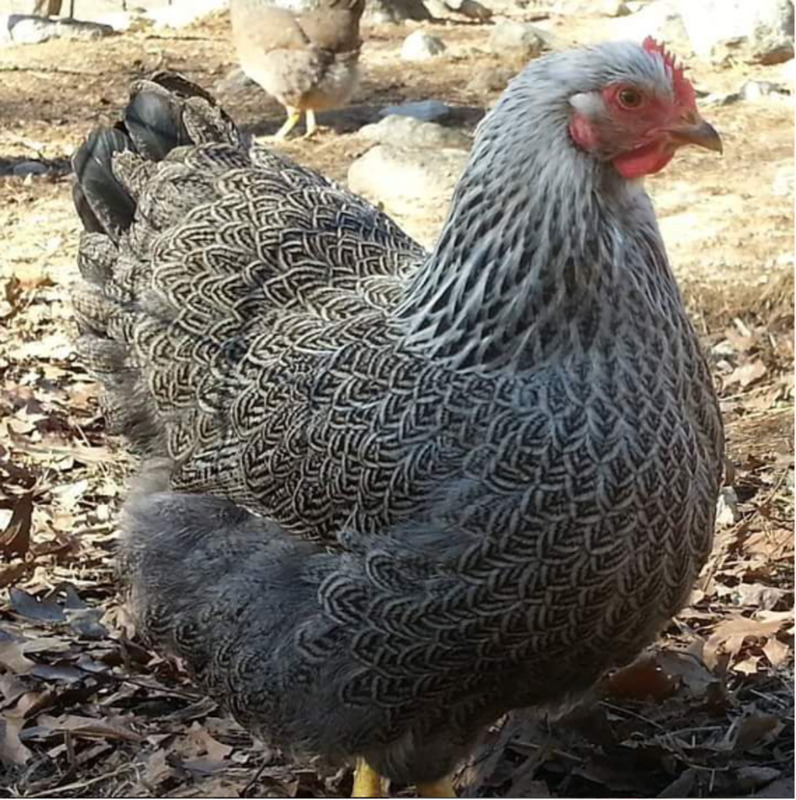 As a newbie chicken owner (layers only) I'm enjoying exploring the different facets of keeping poultry. Shocking to think nine weeks is all it takes for these guys to grow.. ours are the same age but half the size! I can tell Miss Heather takes good care of her birds. Thanks for the post! Aditi, to each his own. I'm just trying to help people who think they want to raise chickens make an informed decision. Btw, we no longer raise this breed, as they have been developed strictly for slaughter, and are usually incapable of surviving long on their own. We can agree that that is very messed up. Its messed up that you raised these chickens from when they were babies and saw them develop into complex creatures with feelings and thoughts, and then just killed them. Best thing to do is just not eat chicken at all.. I am not a chicken expert, so you should also get advice elsewhere. Your description is a bit vague, but are you sure the swelling is not simply a very full crop (food bag)? I don't know how old your chick is, or other details. Did the swelling come on fast, or slow? Over an hour, or a day or more, for instance? Has this happened before? Hope your little one is OK.
My baby chicken is having swelled like sumthing down its neck .. Is it normal or its sick ??? You're welcome. 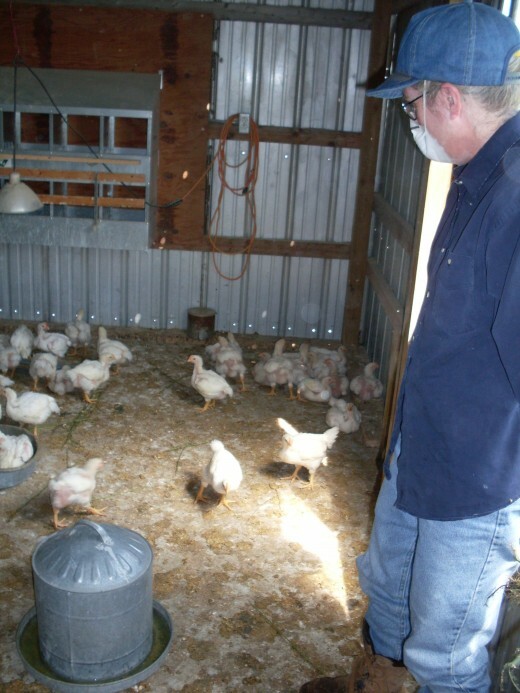 I love sharing knowledge, and am glad your chicken-rearing journey appears to have begun well. Thanks for this hub,it really helped me as a beginner in rearing chicks. Great hub! looking forward to reading more. Adele, I look forward to seeing your additions. 9 years ago from Wirral, Cheshire, England. Great photos - and your flock is somewhat bigger than mine...! Still, my two ISA Warrens may yet have a bit more company. Thanks for reading, Lgali. Glad you like it. You're right, Neil - my favorite chicken soup recipe includes a lot of carrots and some ginger...not many noodles. Plainer, noodle varieties are good, too. Glad I could bring up good memories for you. Nothing like a farm fed range fed chicken - great soup too! Some things about living on a farm I really miss. Thanks for the input. I had heard the same-hour rule from more than one seasoned chicken-raising person, so assumed it was a good rule of thumb. 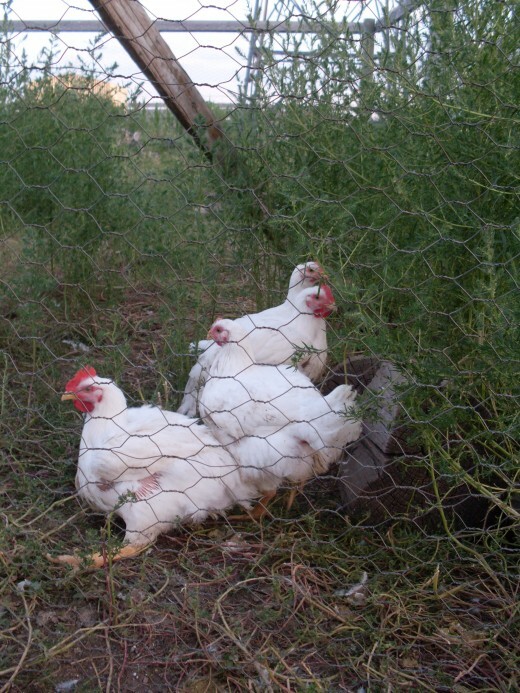 Then, too, there is another aspect to the habits of hens. There is the natural instinct, and this prompts them to lay their eggs in dark, out-of-the-way, hidden places where a predator will not so easily find them. Finally, if one allows one's laying flock to roam freely, one cannot expect them to come in by the clock every evening. Instead, they come in according to the sunset, and do insist on staying out in that evening air until they are good and ready to call it a night! In the long evenings of June, this can be rather late for this particular bird keeper, and I have often wished I could blow a whistle to tell my flock that their time is up, but I have no hope that this would work, so I wait on them. 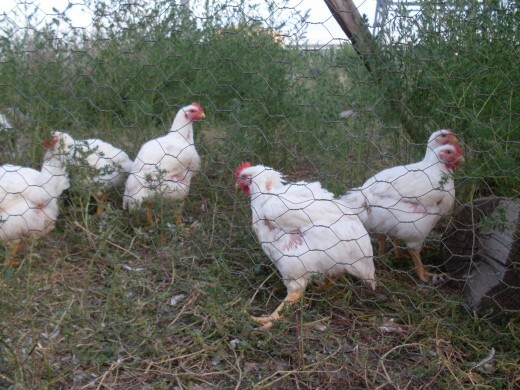 Marelisa, you are right - there can be no comparison between these chickens and battery-chickens (factory-raised). I can't tell if you enjoyed looking at these chicks, but at the least, you were relieved to see their care is good. 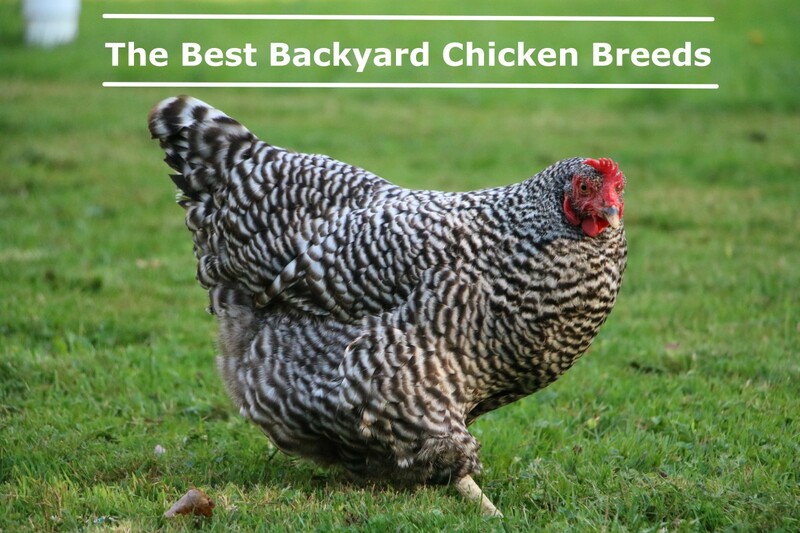 You should know that Miss Heather raises many of these chickens for other families. 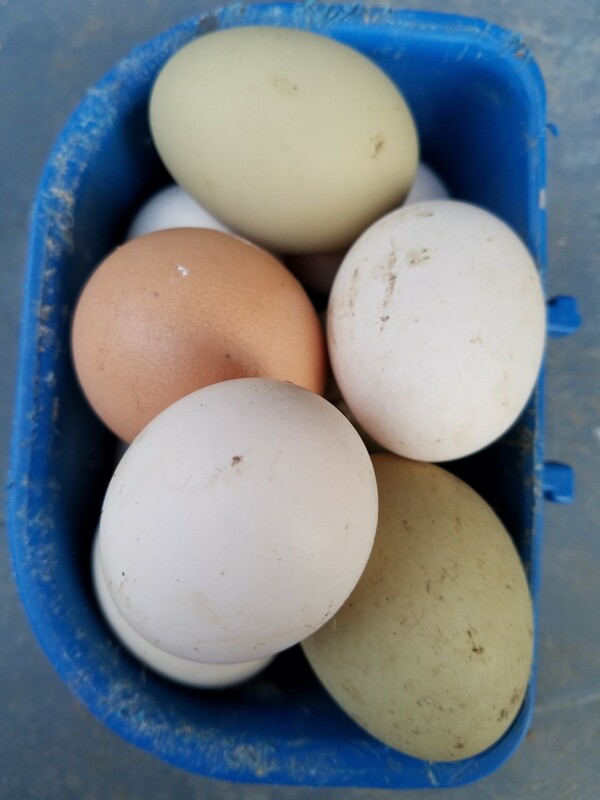 Though I cannot quote a price per bird (I'll find out what that's to be this year, and include it in this hub or the next), I can tell you that buying chickens raised this way is more expensive than normal, but SO worth it. You know they have been treated well, are healthy, and they taste wonderful! I plan on buying three or four of these from Miss Heather. 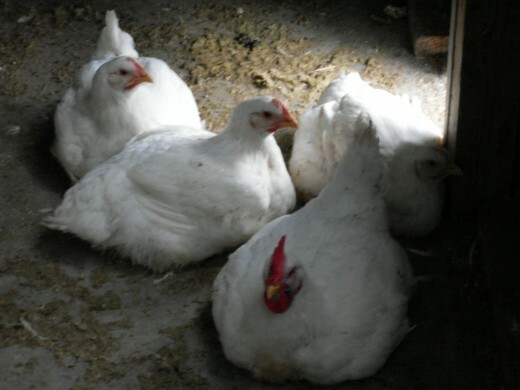 Recently I saw some photographs showing the living conditions of chickens in factories. It was horrible. This is much more, shall we say, humane. Miss Heather certainly has her work cut out for her! However, Miss Heather says "E-e-w!" 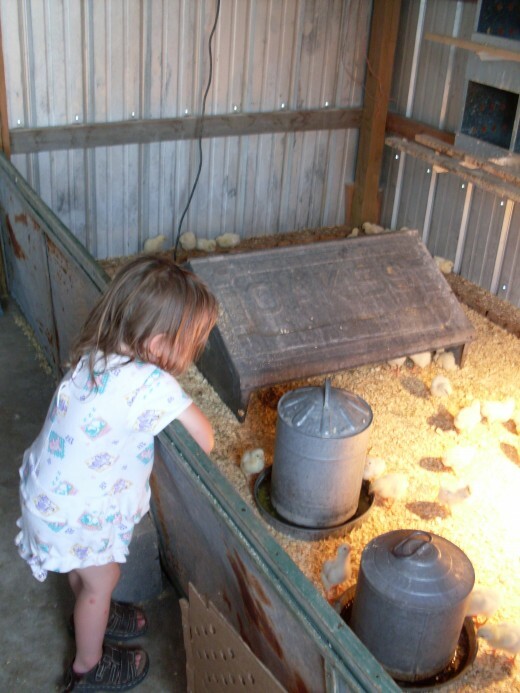 to raising chickens in a playhouse, then using it later for children. :-D Are you going to do a hub? - "One House, Two Uses: Raising Chickens and Children". What a stinky mess! But homegrown chicken tastes so much better than the stuff from the store. I am going to have to look into this for next summer. If we put up a play house for the children, it could be used for birds for a while. 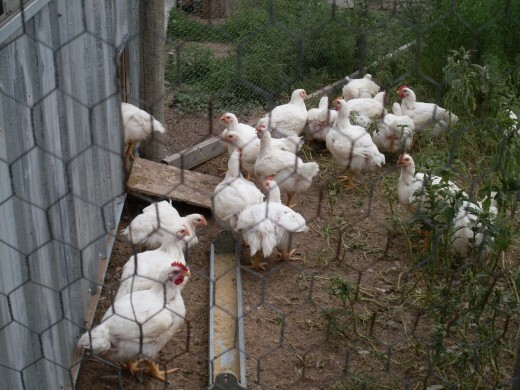 It may not be the most cost effective way to get chicken, considering how much they eat, but what fun to watch them grow... of course, I wouldn't start with 100! Great Hub. I'm really enjoying it so far. I never realized the amount of care that chicks required, 35 pounds of feed per day? For 100 chicks? That's what, close to 3rd of a pound each? More than I thought they would need.